Chronic illness can so easily become a war with our own bodies, making it harder than it has to be. Trust me, after decades of chronic illness and the constant battles, I know the struggles. There is a shortcut. Let’s skip over some of the drama, effort, time and expense and let our bodies work for us instead of against us. Drainage is the mechanism in which our bodies let go of toxins. The skin sweats, we pee and poop, our noses run, and our eyes water. If we were to ingest a highly toxic substance we would vomit. Our bodies don’t like toxins and are designed to get them out as quickly as possible. The problem is that our drainage gets stuck making the toxins get stuck and we get perfectly MISERABLE with symptoms. When effective drainage is established, we can detox and therefore move through illness instead of getting stuck. Getting UNstuck is the focus of drainage funnel. Taking it one effective step at a time opens us up for proper drainage. Each step allows for the next step to go more smoothly. Maintaining each step allows for the drainage to continue which moves the toxins out without war. Colon — When the colon is moving more than once a day it moves out the toxins making way for the next step. Liver, Bile Duct, Kidneys — They can drain better once the colon has made room and continues to drain. Lymphatic — It runs throughout your whole body and when it does not drain well, we can feel it and get bogged down. 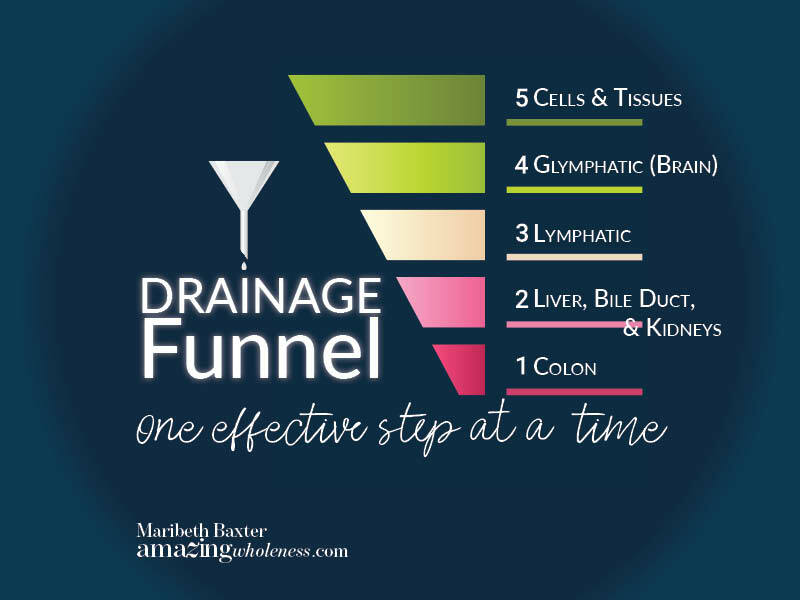 To get it to move/drain, we need the liver, bile duct, kidneys and colon to already be draining effectively. Glymphatic (Brain Drain) — Unless the lympatic system is draining effectively, the glymphatic cannot drain. The glympatic cannot drain properly unless the lymph is draining properly which cannot unless the liver, bile duct, kidneys are draining properly. They cannot drain properly unless the colon continues to drain properly. Cells & Tissues — As everything else is draining effectily then the cells and tisues can. ONE step at a time and drainage becomes more effective and we feel better. We get the toxins out which make us feel more comfortable. When we are more comfortable we see more hope in walking into a healing journey and out the other end. Picture your body as a funnel. Without the bottom (the small part) freely moving and open, the rest of the organs and body systems cannot drain. Keeping those toxins in our bodies keeps us ill, makes us feel like heck, and keeps us from fully living our lives. Simply start at the beginning, the colon. You can find immediate and ongoing relief from many symptoms of chronic illness by this one function. When we are chronically ill and want to move through it, having one bowel movement a day is not enough. 2-3 bowel movements a day is more effective in moving toxins out of our bodies. Remember, we have decades of toxins from our food, environment, prescription medications, infections, pathogens, etc. in our body to move out. Increase hydration — at a minimum, you should be drinking half your body weight in ounces of water daily. That means, if you were to weigh 200 pounds, you would be drinking 100 ounces of water daily. Safe Products — Use natural safe products to support your bowel. Don’t use products that your body becomes reliant on. This Bowel Mover is the perfect blend of ingredients in the proper ratio designed to provide non-habit-forming, safe, effective digestive support. After detoxing in this manner (drainage first), your body goes back to natural peristalsis (normal regular bowel movements). The big picture is The Amazing Protocol, utilizing drainage for more effective detoxing.